It’s been a while since my last blog. This past weekend was a busy weekend for my garden and, as promised, I am writing to tell you that my garden cage is fixed…well, almost. 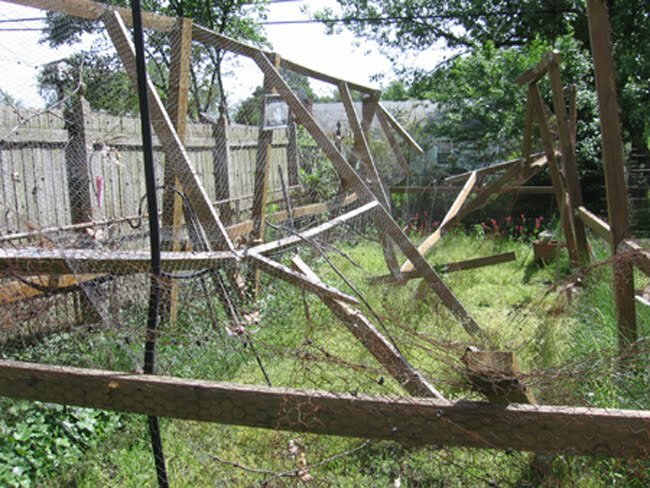 This is what Snowmageddon 2010 did to my beautiful cage. The main beams survived but the ceiling supports snapped. My baby is all overgrown with weeds. But that didn’t stop us. The first day (Friday) was spent prepping for the build, taking down the ceiling beams and cutting away the old chicken wire. That took us about two hours. My wonderful husband then straightened up the main structure of the cage. The damage really wasn’t that bad (which is what he kept telling me…but I’m his wife and it’s my job NOT to believe him). After the main supports were straightened, started to smile and that was the first time I really knew that I would have my garden cage back! To rebuild the cage, we decided to use 4×4’s to give the structure a little more strength. 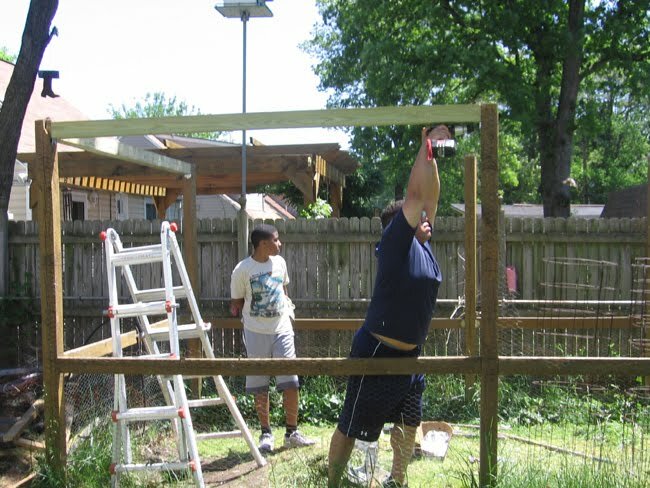 It took my stepson and I to hold up the beams while my husband screwed them into place with metal brackets. That’s the other change, we used three inch galvanized, outdoor screws instead of nails. 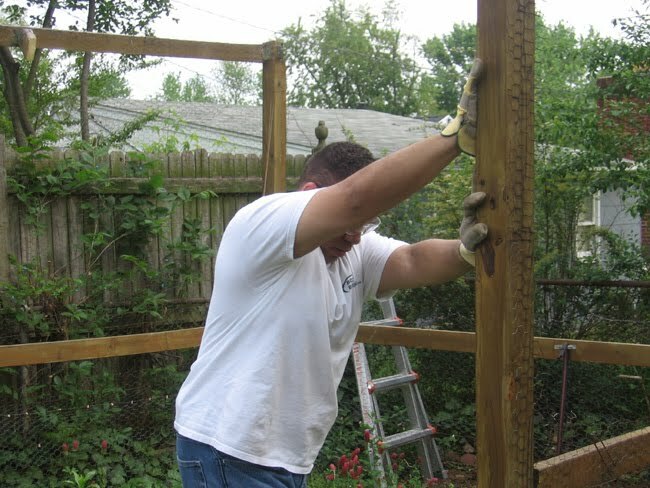 Using a drill to secure the beams to the frame saved a lot of time and elbow grease. Here is hubby putting in the last of the screws on the second beam that we installed. The weather could not have been better. It was about 70 degrees and boy was it windy! But we couldn’t complain because that wind kept us from getting too hot. We worked from about 10am until about six that evening. My allergies gave me no rest, so I sneezed as I worked (just call me Sneezy). The structure is complete. 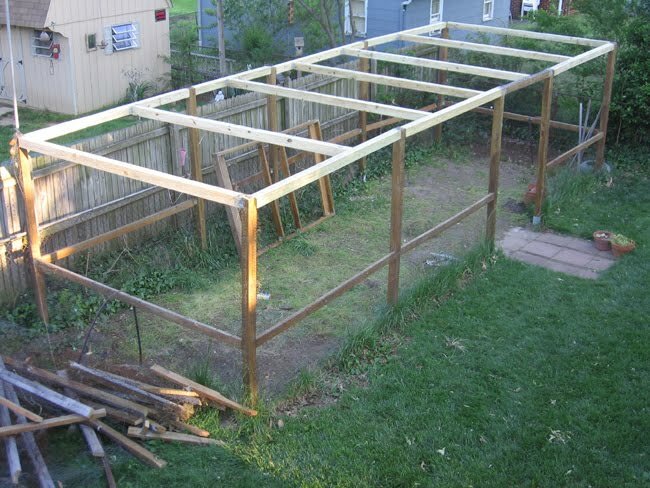 Now all that is left is to put the door back on and wrap the top half and the ceiling in new chicken wire….oh and get out all of the weeds and then plant, of course! So, there you have it! I would say “it is finished” but it’s not quite yet. But it’s finished enough for me to hear the choir angels sing.